As an undergraduate student studying Environmental Science at the University of California, Los Angeles, Sarah focused on atmospheric and oceanic sciences. A highlight of her undergraduate career was conducting research in a biochemistry lab, collecting water samples from Santa Monica Bay in Los Angeles. In the lab, she analyzed these samples for their silica content as part of a study on coastal phytoplankton cycling and its implication for atmospheric carbon sequestration. This research showed that phytoplankton can absorb a large amount of carbon in coastal waterways as they grow, but the carbon is released again as the phytoplankton are consumed by larger organisms. In 2016, Sarah completed her Ph.D. in Civil and Environmental Engineering at Duke University. “I went into environmental engineering because I wanted to learn more about how environmental and human systems interact,” she explains. Her dissertation allowed her to explore this theme through field work in the Peruvian Amazon. “My dissertation research focused on the impacts of artisanal and small-scale gold mining on mercury cycling in the Peruvian Amazon,” she says. “As part of the mining process in this region, mercury is used to extract gold and is then disposed of in the environment. This form of mining is the largest source of mercury in the atmosphere globally.” Sarah worked with a team of engineers, scientists, statisticians, and global health experts to examine both the environmental and human health impacts of these practices in Peru. Sarah’s current work focuses on improving methods for water demand forecasting by utilities and systematically accounting for the multiple benefits provided by many water management systems. In her spare time, she plays trombone in the Walnut Creek Concert Band and likes to compete in triathlons. 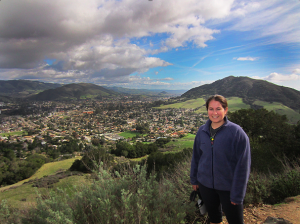 Sarah says she can be found most weekends hiking or biking in the East Bay and playing board games with friends.